In 1976, Stephen Varble stormed a bank in a costume fashioned from filth. Wearing a netted frock made from fishnet stockings and the packaging of a Christmas tree – interspersed with dollar notes that hung like baubles – Varble strode into a Chemical Bank branch in New York with the impetus to disrupt. He screamed – with a voice that had been described as able to “hike up to a gargled shriek” – that an allotment of money from a forged cheque must be returned to him. When a teller rejected his bold claim, he reacted by violently puncturing his breasts with a fountain pen. His bosoms, which were condoms filled with cows blood, erupted with liquid crimson. Manically, Varble started writing cheques for “none million dollars”, signing the documents with blood. Patrons applauded as he left the building. 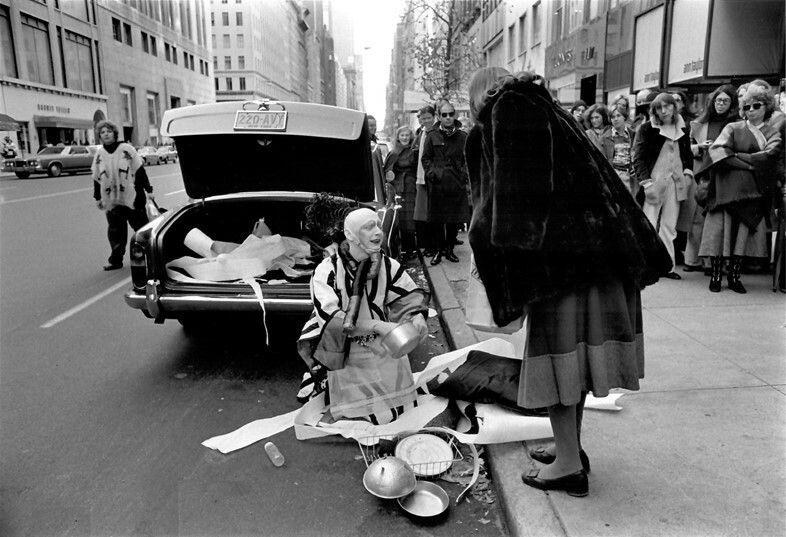 This would come to be known as Varble’s famed “Chemical Bank Encounter” (1976) – but it was not the first time the antagonistic provocateur used theatre and garbage to confront institutions which instilled value, and in-turn, diminished things and those not deemed worthy. In a shabby press release from 1976, Stephen Varble lauded that he is, “the best private theatre available for the rich”. He was a multidisciplinary anti-establishment artist who, throughout the 1970s, attacked ideas and spaces that established class, capitalism, and commodification. He spearheaded the gutter art movement in New York which, through avant-garde film, performance pieces, and costume design, took aim at ideas which fuelled hierarchies. Varble would scour the streets for trash, food waste, and stolen objects, which would be materials for his ornate garments. Rich with texture and colour, he played with properties of gender as his dress moved between the binaries of it. He wore make-up, dresses, pants, and accessories. His appearance also helped Varble establish his “Madame Debris” alter ego, who sometimes lead unauthorised gorilla tours through SoHo galleries, museums, and boutiques. Most importantly, Varble wanted people to look towards the gutter, to see the beauty in the discarded. As a man with HIV in 1970s New York, Varble was in the middle of the epidemic and the stigma that surrounded it. As a result of the disease, his craft and life were lost in 1984 when he died at the age of 38. The Leslie-Lohman Museum of Gay and Lesbian Art in New York has resurfaced Varble’s work in an exhibition titled RUBBISH AND DREAMS: The Genderqueer Performance Art of Stephen Varble. Through the careful curation of David Gesty, the exhibition runs until 27 January and aims to showcase a brilliant talent whose story was buried. Here’s everything you need to know about Stephen Varble before you get there. Varble was born in Kentucky in 1946 to two devout Methodist parents. As written by friend and protégé of Varble, Fernanda Eberstadt, “Stephen was a mamma’s boy.” But, as Eberstadt claims, “he must have known pretty early he had to hightail it to a big city”, and he left the south-east. Varble moved to New York at the age of 25 to attend graduate film school at Columbia University. On the side, he waited tables at an ice-cream parlour, but this colourful side-step didn’t last long. Eberstadt claims Varble was “fired for performing stripteases for the customers”. Referring to him as “Him. Her. Them. The Apparition”, Eberstadt remembers the first time she met Varble, writing, “The Apparition is a bearded young man, lunar-white except for the lavender-and-pink eye makeup.” He was wearing a crown of half-burnt wooden matches, and a gown adorned with labels from Seagram’s V.O. whiskey. He polished off the look with tall black pumps which accentuated his long white legs. While Varble was studying at university, he made a start on his artistic career springboarded by absurdist plays, like “Silent Prayer’”. His stage performances were guided by self-written scripts and filled with his own handmade intricate costumes. It was during this period that Varble met his romantic partner, Geoffrey Hendricks, who introduced him to a new world in the New York creative community, and, more importantly, the fluxus movement, which taught him performance art could be transported from the stage to the street. The fluxus movement emerged in the 1950s and defined art synonymously as an object and experience. Geoffrey Hendricks spearheaded the practice, and his teachings rubbed off on Varble. Naturally, Varble began to experiment with his mediums. Varble began writing for Andy Warhol’s Interview magazine. Warhol even went as far as claiming that Varble’s work was “practically sublime”. Varble was also lauded by renowned ballgown designer Charles James, who said that each of his creative constructions were varying degrees of an art form. As Varble took his craft to the sidewalk, he was photographed by East Village punk photographer Jimmy DeSana and nightlife photojournalist Allan Tannenbaum. Despite Varble impressing the right people, he wasn’t interested in the New York art elite. Instead, there was something virulently anti-institutional in Varble’s ethical beliefs, which, “made him sabotage any glimmer of even supposedly ‘indie’ success”, noted Eberstadt. Instead of hanging up his work in galleries, he chose the gutter. Varble became obsessed with creating confrontational events which disrupted public life, and began leading punk excursions of New York through galleries, boutiques, and museums as his trashy, boisterous alter ego Madame Debris. He targeted such locations because he saw them as spaces of affluence and luxury, which took pride in commodification, capitalism, and class. His ostentatious costumes, make-up, and hairstyles were Varble’s means of challenging binaries. He wanted to force people to look at the grimy gutter, which was represented by himself and his medium, and relished in the idea of pushing boundaries of cultural stigmas, particularly sexuality. “(He) would do all of these things in order to confront people more visibly with a complication and a disruption of their expectations about what gender could be,” recalls Getsy. For Varble, the gutter and his identity were linked. These performances were rooted in his inner-queer experience, specifically how society culturally diminished non-normative sexualities and genders. The gutter is a place we look down upon, reserved for the abandoned, the devalued, and discarded. Gutter art is a movement which forces people to analyse why we perceive the pavement and people at the lower-rung of society with such inferiority. Varble possibly saw himself as occupying this rung as a queer, trans man, living with HIV. He thought about the ways he could invert the hierarchies of value while trying to wrestle with concepts that aren’t normal – or are dirty or worthless. He decided to transform these ideas into fabulous and glamorous scenarios which were daring, but beautiful. For the last five years of Varble’s life, he worked on an epic piece of cinema called, Journey to the Sun, which features every costume he’s ever crafted, accompanied by a heart-warming script. “He became a religious recluse, got Aids, and died,” writes Eberstadt. Varble’s artistic history was lost due to a number of reasons. Firstly, the nature of performance art militantly resists commodification and is ephemeral in nature. Another reason is the material that Varble used for his costumes was essentially garbage, and, thus, biodegradable. They’d naturally fall apart or were re-used to make other garments. Finally, the artistic gay community was decimated in the 1980s due to the onslaught of HIV/Aids. 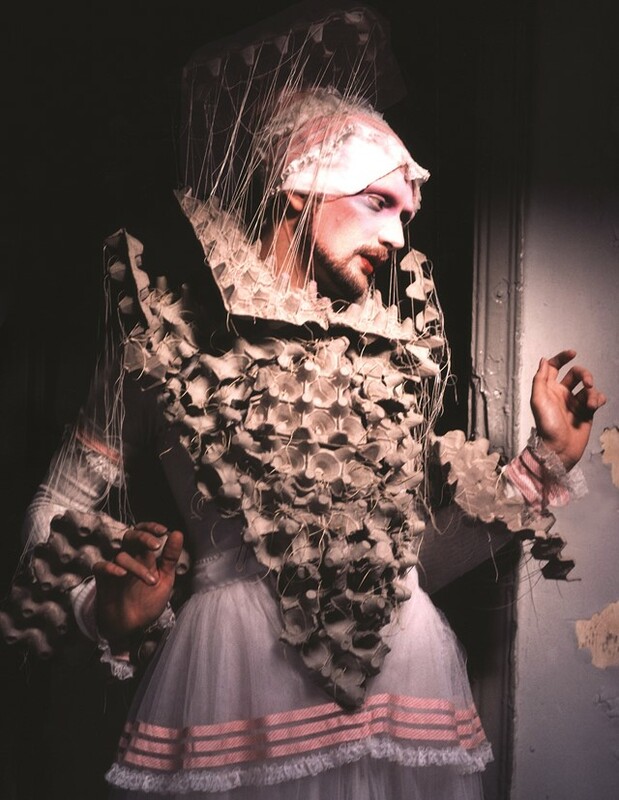 Many of Varble’s contemporaries who attended his shows, photographed his work, helped assembled his costumes, collaborated with him, and rallied around him as an ally, died from HIV/Aids and were forgotten, much like him. Varble himself died of Aids-related complications in 1984. When he passed away, his possessions – which included drawings, videos, and costumes – were passed over to his partner. When his partner died two years later, the gutter art was discarded; his work was returned to from where it came from. Getsy says that lost stories such as Varble’s aren’t uncommon. Not only does the world forget, but so do some of their loved ones. “Their families would sometimes choose to forget them or think that the evidence of those lives is not important,” he says. 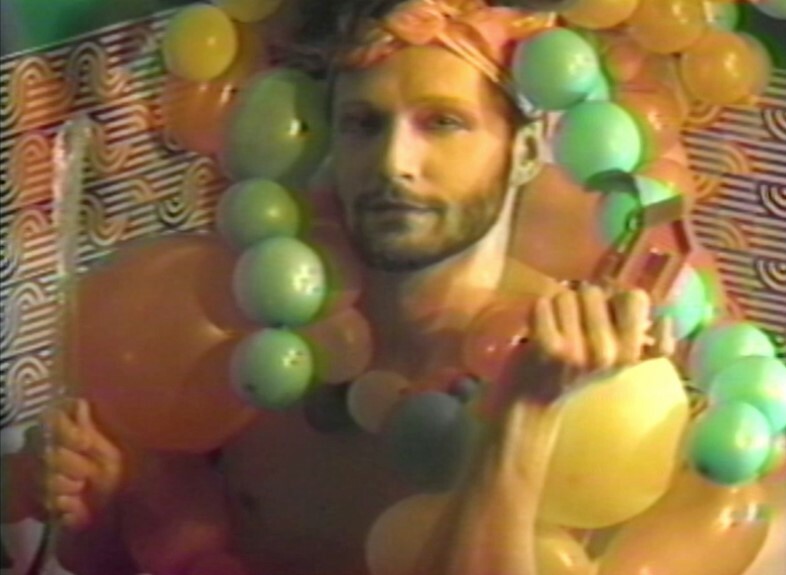 However, almost 50 years later, the world is starting to uncover Stephen Varble as an individual whose aggressive aesthetic and ideas were pivotal to genderqueer performance art. Getsy even goes as far to argue that there’s no better time than now. “One of the things that have been really encouraging for me is how timely the exhibition is for so many people,” he reveals. “Here’s an artist who’s a critic of commodification, he’s anti-capitalist, he’s disruptive, he’s DIY, but also he’s taking on an approach to gender that refuses a binary model. And he does it in this spectacular mode. I think that the present mode allows us to see the complexity and the radicality of Varble’s work much more clearly." Maybe through a 2019 lens, Stephen Varble will be remembered.